Yay finally got the Great Red Spot! Throughout the years observing and taking photos Jupiter, I’ve always wondered if the darker detail I was observing was the Great Red Spot. Based on date and time it’s possible to determine if the GRS is in view, plenty of software and tables out there for that. 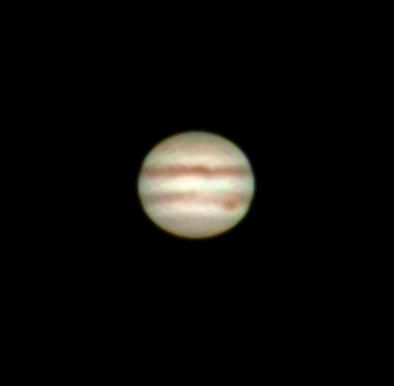 But now I’ve captured my first picture of Jupiter where the GSR is unmistakable, 672 million km away. April is prime Jupiter observing time, as Jupiter reaches the meridian just before midnight. And we happen to be at time when the Earth-Jupiter distance is at its shortest, so don’t miss out! As it’s high in the sky, there is less turbulent atmosphere to peer through and the seeing is better. 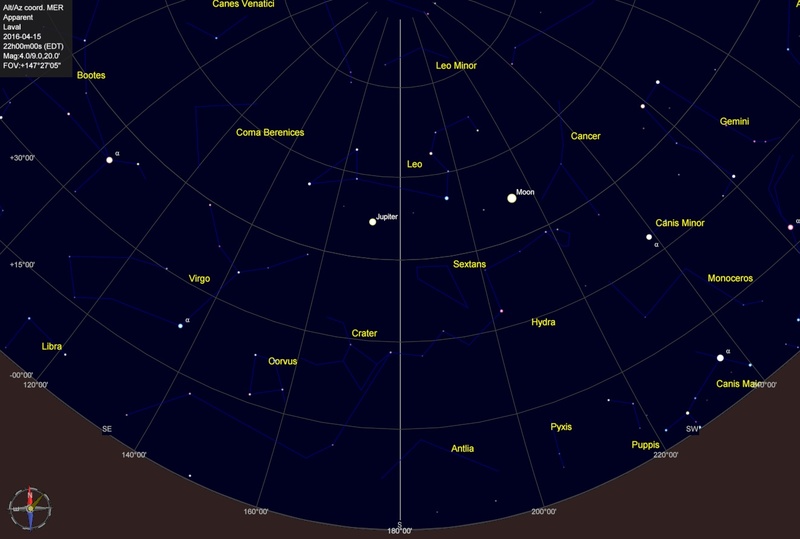 The chart above is the sky due south at 10pm local time on April 15th. And if you have a set of binoculars, camera zoom lens or telescope you’ll easily be able to see four of Jupiter’s moons all lined up next to the planet. This entry was posted in Photo and tagged Astrophotography, Great Red Spot, Jupiter by Benoit Guertin. Bookmark the permalink. On the home page, right hand side, is a button to follow my blog. You can follow via WordPress or e-mail. The WordPress environment makes it very easy. It comes down to taking the time to create or share content. If you already write in a dairy on a regular basis, then you’re off to a good start. Just keep in mind that it’s public hence anyone can read and comment, including people who don’t share your views.